On September 29th, 2018 Hockey Fights T1D will be holding its 5th annual event to benefit the JDRF (Juvenile Diabetes Research Foundation). This year we are asking that you join us in our efforts to raise money to find a cure and spread awareness about this lifelong disease. Your logo on the front of the jersey in the upper left chest area, your company logo will be on the back of the players shirts, a 27 X 18 sign with your company logo and name on it, as well as your company logo on our website, Twitter and Facebook naming you as a sponsor are included in this package. Your name on the bottom of the backs of the jerseys, your company logo will be on the back of the T-shirts, a 27 X 18 sign with your company logo and name on it, as well as your company logo on our website, Twitter and Facebook naming you as a sponsor are included in this package. Your company logo will be on the back of the T-shirts, a 27 X 18 sign with your company logo and name on it, as well as your company logo on our website, Twitter and Facebook naming you as a sponsor are included in this package. A 27 X 18 sign with your company logo and name on it and your company logo on our website, Twitter and Facebook naming you as a sponsor are included in this package. An 18 X 12 sign with your company logo and name on it at the event and your company logo on our website, Twitter and Facebook naming you as a sponsor are included in this package. Your company logo will be placed on our website, Twitter and Facebook naming you as a sponsor. 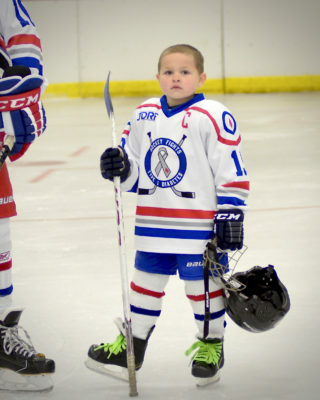 Checks can be made payable to Hockey Fights T1D sent to PO Box 300 Clark Mills NY 13321. If you would like to pay by credit card please email this form to Matt@HockeyFightsT1D.org and we will send you an invoice via Square or make arrangements to meet you in person. Thank you for your support to make Type One Type None!